Proud New Yorker interested in the contributions of women to our city. Author, expert and teacher on Chinese art and culture. Chinese New Year 2015 ushers in the Year of the Sheep. The American evening news will be full of quaint references to the new year mascot along with more serious news of China's growing economic might. Americans seem to make no distinction between ancient beliefs, such as the Chinese zodiac, and the financial actions of the world's rising economic superpower. And maybe we're right. What are the lessons that we can learn from this year's celebration of the Year of the Sheep? The Chinese New Year, also called the Spring Festival, is China's longest public holiday. This year, most Chinese will not work from New Year's Eve, February 18th, to February 24th. The world's second largest economy will effectively grind to a halt. People travel the length and breadth of China in order to join their families. Plane and train tickets are often bought for the next year's festivities, a year in advance. These aspects of Chinese New Year tell us three things. First, China's vaunted infrastructure does not meet the needs of the Chinese people. It may boast high speed trains connecting metropolitan centers along the east coast, and even a train to the Roof of the World in Tibet, but it isn't sufficient for the needs of its population. Second, China has a huge population of migrant workers who have left home to work in factory cities because there are no suitable jobs at home. There are estimated to be 260 million such workers in China today. Compare that number to the entire population of the United States, some 316 million souls. Third, the Chinese family remains the focus of life in today's China. Let's take a glimpse at how the New Year unfolds for most families in China. On February 18th, most families will stay up late to watch the New Year Gala on government-run television. Chinese Central Television (CCTV) is accessible to more than one billion viewers. American businesses would do well to tune into this year's CCTV gala broadcast and learn more about their potential economic partners during the Year of the Sheep. Be warned, it's an all-night affair with a time somewhere along the lines of Gone With the Wind -- without bathroom breaks. The theme of each year's gala is chosen to reflect vital government concerns and accomplishments. his lavish production with popular entertainers, gorgeous costumes and upbeat songs is designed to display the country's progress, reinforce faith in the government and cement Chinese nationalism. The performance includes a literal "cast of thousands," that Tinseltown hasn't seen since Ben Hur raced his chariot in Rome before thousands of extras. The special effects are akin to Katy Perry's halftime performance at the Super Bowl -- times 100. This is government business in China. The extravaganza invariably depicts scenes of China's contemporary life side-by-side with traditional festivities. The message is clear: Modern China is based upon a foundation of Chinese traditions, customs and beliefs. Becoming a modern nation does not mean acquiring Western trappings wholesale. It does not mean discarding Chinese values. Today's China has roots that stretch back thousands of years and unite the Chinese as a people. Many of the professional entertainers performing in the New Year Gala come from the ranks of the People's Liberation Army (PLA). This stems from a directive by Mao Zedong himself, when soldiers from the PLA scoured the countryside to gather folk songs during China's civil war during the 1930s. These tunes were re-written with lyrics outlining Communist goals for the country and urging the people to follow the Communist Party leadership. The 1939 Chinese film, Yellow Earth, available on YouTube, revolves around characters caught up on this initiative. This artistic policy still holds true in the case of the annual New Year Gala. And there are lessons we can learn here as well. 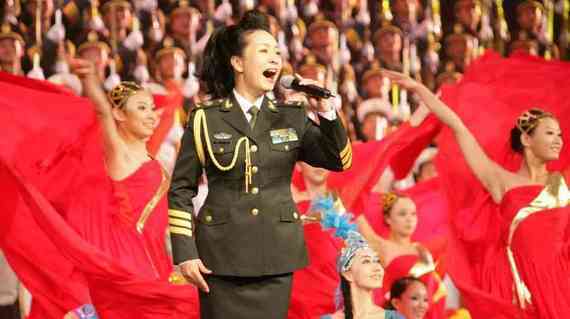 Today, some of China's most beloved and recognizable entertainers are members of the PLA. In fact, China's current First Lady, Peng Liyuan, holds the rank of Dean of the People's Liberation Army Art Academy, a civilian rank equivalent to a major general. Even Wikipedia describes Peng Liyuan as "a renowned Chinese contemporary folk singer and performing artist" before mentioning her role as China's First Lady. And before Xi Jinping rose to national prominence, most Chinese recognized Peng Liyuan from her singing-dancing performances that were featured on Chinese television and film. As China's First Lady, she is a distinct departure from the drab political wives of yore. She is also the personification of Chinese political and economic aims: a prosperous China in which all regions and people enjoy internal stability, rising economic expectations and unquestionable nationalism. 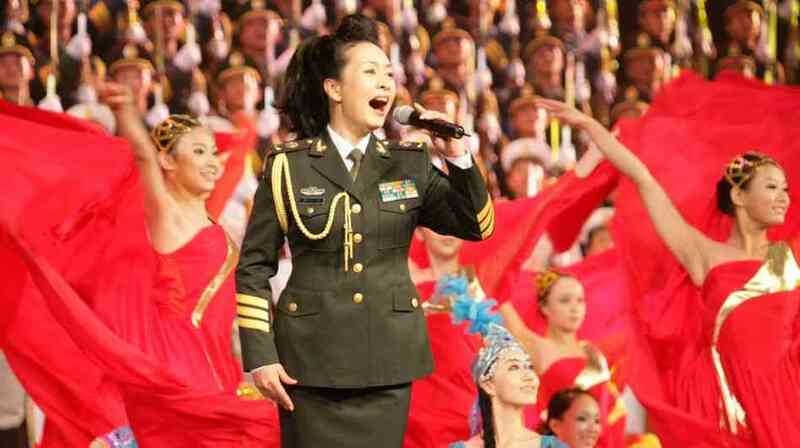 YouTube features clips of Peng Liyuan performing in a variety of routines, often backed by the vigorous participation of dozens of identically-dressed young women from the PLA. They are often wearing the ethnic dress of one of China's 54 recognized minorities. The applause during the New Year Gala is usually greatest for the performers of ethnic song and dance numbers, including Tibetans and Uyghurs. Peng Liyuan holds an MA degree in traditional ethnic music to add that authentic touch to her performances. These performances are both entertainment and part of a campaign of national unity. China's minority people live mostly in the poor and mountainous regions on the borderlands of the country. These performances help the Chinese government project a unified image, crossing and obliterating regional and ethnic lines. Practitioners of Chinese astrology predict stabilizing political and economic situations, and improving quality of life for most people during the Year of the Sheep. So, this Spring Festival, those planning to do business in China should tune in to the CCTV New Year Gala. You will be joining the world's largest audience. Enjoy the fireworks and dancing girls, but keep your eyes on the underlying information and messages about China. You won't need subtitles. The CCTV New Year Gala can be watched on the cntv.cn website. Here, you'll find clips from past galas and English-language discussions. Watching these will allow you to form your own opinions about China, its people and our shared future with this rising superpower.